Edith is an avid photographer and writer who is pursuing a career in editorial. She graduated from RISD and has spent time at The Whitney and Into The Gloss. She has written for Refinery 29 and has recently shot for Teen Vogue. TVPS: How was your time at RISD? EY: I really loved being at RISD. I went to a more traditional boarding school for high school and then I took a gap year, so I felt like, instead of repeating the experience that I had before at Andover, I was able to do something completely different. I think I was definitely out of my comfort zone in a lot of ways but it ended up being the perfect fit and exactly where I needed to be at the time. Comparing RISD to a city design school, did the campus have an influence over your time there? It was definitely part of why I wanted to go there. RISD’s campus overlaps with Brown so you can walk up the hill and feel like you are on a traditional campus, which was more comfortable to me given my previous experience at Andover, and Brown’s campus fostered a sense of community in a way that art schools don’t always. Did the people there influence you at all? Yes. It was great to be able to take fine art classes where there are these RISD students who are thinking on completely different wavelengths than you are and to learn from that. Also, I had a handful of professors who were really amazing. Looking at your experience it kind of looks like you went from fashion designer to having a strong interest in art galleries and then production and now editorial. Do you want to give an overview? In high school, I wasn't the most well-rounded person, and didn’t really want to be one either. I already knew I was interested in writing, art and design. Then it became important for me to take a gap year to further pursue those things I knew I was interested in. I experimented a little bit. I went to this semester-long art school called the Oxbow School in Napa, California, which was really awesome. After that I interned at Pace Gallery to see if I was interested in the commercial side of the art world, but I wasn't particularly. I worked at a paper product company called Meri Meri, which is based in England. I designed a birthday card for them and a mockup of a wine bag. I loved that because I was on the creative team and the production side of things. Then I had a stint where I worked at a few museums over the course of two years. I worked at the museum that's on Andover’s campus, the Addison Gallery, as their summer curatorial intern, and then I worked at the Rubin Museum in New York. Then I went to The Whitney and I worked there for a summer in their Education department and did a lot of digital media work. Photographing for their website, editing videos for their Watch and Listen channel, and those sorts of things. From that, I decided that I wanted to be more in the thick of things, and more immersed in the creative side rather than in a more administrative role. That's why I wanted to work at Into The Gloss.I knew that something big was definitely brewing there. They had just launched Phase 1 Glossier and they clearly had a system for how their editorial worked. The creative side was really strong, and it definitely has shaped where my ambitions are now. It really did give me a boot camp training in editorial and how to professionally work with the content management system and how the process goes from interviewing a person to the final edit. And, for other kinds of stories, how to conceptualize ideas and make them happen, and then seeing how the creative team works in tandem with that. And now you’re about to be the editorial assistant at Outdoor Voices. The role is primarily supporting OV’s editorial director and working on the content for OV’s editorial platform, The Recreationalist, along with e-mails, social, and campaigns. I had been trying to decide through the fall whether I had wanted to do something more writing-oriented or more visually creative. I was feeling like if I chose one over the other, I could freelance for whichever I wasn’t pursuing in my day job. I was deciding which field was better to have a lot of structure and mentorship in and which was going to be better to do on my own. I decided I'd rather be trained by professionals creatively and I felt like I could write on my own. I enjoy pitching stories and making them happen on my own time. Evaluating where your ideation is the most refined is a good way to figure out what kind of work you should do freelance. I saw an opening for an editorial assistant at Outdoor Voices online and I applied for the job. We had a phone interview first, and then subsequently a series of meetings. What's exciting to you about where they're going? I think they're tapping into something that's similar to Glossier. It’s this market where so few people saw that there was a hole, but there is this growing community of people who feel like OV is filling that hole for them. They’re active, but don't want to be judged by their performance. The part that is the most fun for me is OV’s visual identity. If someone doesn’t know what the products are, I describe them as workout clothes that look like they were inspired by Ellsworth Kelly paintings. I know you haven’t started yet but can you touch on the company culture? It’s a really friendly atmosphere. Then Teen Vogue, congratulations. Do you want to talk a little bit about how that happened? I sent them a cold pitch. I knew that RISD has the fashion show every year and the work is always stellar. I saw your photos; they were really good. I thought this was a good process for the apparel seniors to see too, to get a sense of how editorial coverage stands in relation to their work. Why is that important for them to see that? A few things were lost in translation with the story and I think it's useful for young designers to see how many hands these things go through. It's important to have a sense of how content filters through an editorial masthead, so that they know how they can best protect their work and make sure that it’s always credited correctly. A great part of that was, I watched Tom, who shoots for Into The Gloss, all summer. Everything good that came out of that Teen Vogue story was stuff that I had absorbed from Tom. It was fun to feel like I couldn't have done it without that training from last summer, particularly when it came to photographing models with an editorial endpoint in mind after I was so used to photographing my friends in more spontaneous situations. Do you think the fashion industry can be defined? I think there's a core of the upper echelon with buzzword names like Dior that people would associate with the fashion industry. I'm very excited by what's happening more on the fringe of things, like with Eckhaus Latta. They're great, they went to RISD, and the way that they approach every step of their process is as if they're reinventing or re-envisioning these tired conventions in fashion. For example, for their early Steve Jobs-inspired line, in lieu of a tag, the designers printed ‘Eckhaus Latta’ on a grain of rice, placed it into a vial and attached the vial to an article of clothing. I’m really excited about those new enterprises that are a little less definable because they're straddling the line between art and fashion. And for completely different reasons, I also think Man Repeller is really amazing. I'm interviewing a girl from there. Really? That's awesome. Leandra goes to fashion week and she's definitely in the thick of it but she's also thinking about highfalutin fashion in a completely fresh way, and making it more accessible through humor. Emma Hager. She was there for a summer. It’s such a small world; Emily interviewed her for ITG. What are some of the challenges that kids face when entering the fashion industry in 2016? A lot of people want to be their own boss and have been grooming their own creative vision for the last 4 years. You get to the peak of your college career and suddenly, upon graduation, you're a new employee on the lowest rung. I think that's one of the more stifling challenges of being a creative in the fashion industry. My personal philosophy is to be really well trained very early on in your career and that that will benefit you in the long term, especially if you aspire to be entrepreneurial later. You should be working with people who are much higher up than you and learning from them, in whatever field you are in. If you want to be a graphic designer, you should be an assistant to a legendary person and that way I think you'll learn the most. It’s an investment for the long term. Rather than trying to do your own thing right away when you graduate, though there's occasionally the unicorns who can pull that off. What effect is the digital world having on the industry? I think in a lot of ways it is great that it's democratizing. Places like Man Repeller wouldn't exist without it. I think those are really great places where digital media is really helping out the industry. Direct-to-consumer startups like Glossier are really exciting. The one thing that I'm not super in favor of is the churning out of content constantly. In a perfect world, we should have really good features written by really good writers, and not all of the fluff that's out there. I think changing the ways that those websites and publications make money is the way to take that apart but I don't see that happening any time soon. Who are your role models right now? Definitely Ferber. She’s the best editor I’ve worked with, and holds her own writing to a really high standard. I also really admire this writer Molly Young from afar. 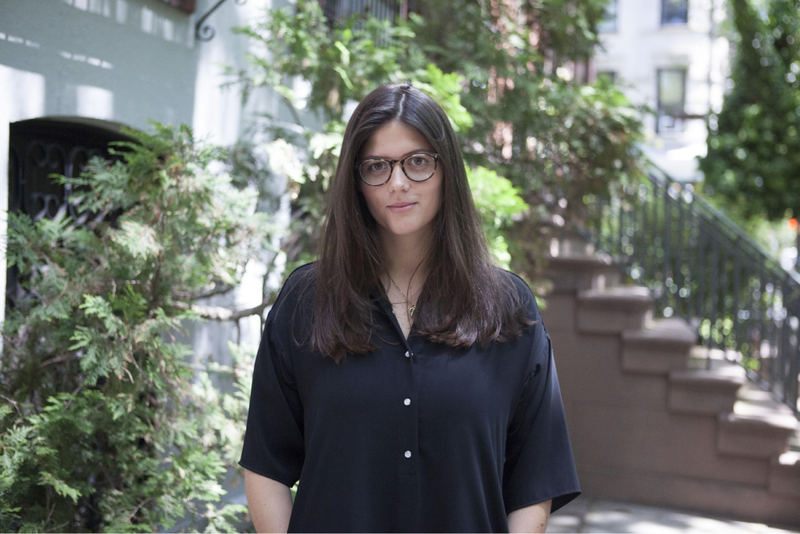 She writes copy for Warby Parker while writing prolifically and perfectly for publications like The New York Times and New York Mag. And of course, my mom, who started out as a journalist for Sports Illustrated and has now segwayed into a career in design. She handles everything she does really gracefully. I’m also in awe of Jill Soloway, who created the Amazon series Transparent, because I think it’s the greatest show I’ve ever seen and that’s saying a lot considering this moment is the golden age of television. You have a really strong aesthetic, how did you go about developing it? I don't feel like I go into a creative project with a certain aesthetic in mind. Though I do think I have a proclivity towards certain things. After studying art history, photography and graphic design, I feel like I have sort of an encyclopedia of references that I can pull from. I try not to limit myself too much with an aesthetic because I know it’s going to come out a certain way. Does your camera choice influence what you're getting? Yeah, definitely. I shoot most of my projects with a Hasselblad, which is a medium format film camera. That definitely in itself has its own limitations, so you have to be really specific about what you want to shoot already. Also I think going to boarding school and then combining it with art school created this really weird aesthetic that I'm just going with. It’s sort of a challenge for my aesthetic. Right now there’s this “girlhood” work being published in the fashion sphere and it’s a lot of Petra Collins-esque work with pink neon. It doesn't seem like there's a ton of space for what I'm shooting at the moment. Not preppy necessarily, just something that doesn't fit into that school. It's mainly just more of something that's in line with the Bruce Weber aesthetic that's not getting a ton of airtime right now. But couldn't you benefit by not fitting into a category, doing your own thing? I think eventually I could benefit from it, but right now it's like there isn’t much of a space for it if you’re not yet an established figure in that world. I am super persistent and I can deal with rejection well. I send out pitch emails and know no one’s going to respond and I'm fine with that. Just hoping one editor will see the potential of a story or idea is enough for me. I do feel like I've built a great network over the last year after writing a lot and working with new editors and doing a couple other projects, but I don't rely on asking for favors, which is a philosophy that has helped me pursue my ambitions really independently and fiercely. What's the most rewarding aspect, what you do now? I think the favorite thing that has ever happened was after I wrote this piece about the Andy Warhol show at the RISD Museum for the campus blog at Brown. My brother, who plays lacrosse for Notre Dame and couldn't be more opposite from me on paper, read it, and told me he had learned so much from it because it was accessible but didn’t dumb down the ideas or require a previous understanding of Warhol’s work. It made him more interested in art, and that's most rewarding: when you can teach someone and sort of ignite curiosity in them from a topic like art history that they don't know much about yet. It'd be like getting you interested in sports. Oh I saw that. It was really good. Thank you. A friend loved the illustrations and started drawing again because of it. So I think those are really the most rewarding parts of it, if you can make other people feel like they have something to express or do have their own creative capacities. Inspiring real interaction with your work is far more rewarding than counting likes on an Instagram. Do you think it's important for someone who's our age maintaining an online presence? I do think it's very important, and to do it in a way that stands out. Counter intuitively, one of the things we learn at RISD is how important print is. We all go into RISD with a Squarespace website, and you kind of assume you're never going to have to print out a photo in your life and they quickly tell you that you're wrong, that we're not critiquing the photos on a projector and you have to learn to interact with the work in physical form. But I do think just presenting your work in a way that's engaging and will attract someone to your website is definitely important and it's a really good way to get gigs, too. What is your take on this generation and where we're going? I feel optimistic about where our generation is headed. As a young woman born in 1993, I feel really lucky that there is this group of women not much older than us who have paved their own paths and have become role models after, historically, professional women didn’t have much to look up to for so long. The creative people in the Lena Dunham orbit for example, like Audrey Gelman and the illustrator Joana Avillez, have become this example of how to be hardworking and creatively prolific. They maintain a connection to fashion while writing for The New Yorker and working in politics. How would you like to see this industry evolve and how will you be apart of that happening? A big way that it's evolving now is inclusivity in the people that we feature on covers or we cast in editorials, especially in terms of races and sizes. I think it's a really important leap that we're finally making. Just like with Barbie Ferreira, who's represented by Wilhemina and was recently in an Outdoor Voices editorial. I think that's really great because it drives home the idea that you can be active and healthy and not have to have the body type of a professional athlete without qualifying a person as plus-sized. I think open-mindedness in casting is really important because it has such an effect on everyone who's consuming that media… basically the entire country and people around the world. I think that's a major way that I'd like to see the industry evolve more, but it's definitely already happening. Featuring people who fit more than one mold is really important. Diversity and the impact that that has on a population as a whole? What advice would you give to someone that looks up to you? My advice would be, don’t be afraid of being very self-directed and hustling, but also know that just because your friend has a big break when you're a sophomore in college doesn't mean that you missed the boat. I think there are a lot of advantages to feeling like you're still forming as a student or an artist, or creative, or a writer when you're in college, and not feeling like that's the moment when you're supposed to make it big and score your first feature. I think being confident and taking the time to develop rather than jumping into it when you're not ready is really formative. Work makes work, and the more you produce and refine, the more likely it will be that other people will start to notice and want to collaborate. You don’t have to wait for someone to give you permission.